Since it became independent in 2003, the component manufacturer W+W Aufzugkomponenten GmbH u. Co. KG has established itself on the German and recently on the European market. Productive diversity and competence in consulting and development have made a decisive contribution to this. This is particularly clear currently with regard to LED cabin lighting. The company's core skills are divided into three business segments. Without doubt the best known is the retrofitting products segment. Traction sheave covers, shaft lighting, cabin aprons, emergency stop and alarm switches have been a market success for years. This is due not least to the high quality, enormous scope of supply and short delivery times. In addition, the targeted development of individual products on the basis of standards and customer wishes likewise contributes to customer awareness of the articles. Another business segment is shaft equipment products. Over 15 years of experience in the area of shaft copying are reflected in quality and reliability. Complete shaft installations for the safety circuit, pit control boxes and all travelling cables in stock, leads and various electrical installation material items round off this segment. However, the latest and currently also most innovative business field is undoubtedly the cabin lighting segment. The focus here is on the development and constant adjustment of the LED cabin lighting programme. As a result of new ordinances and laws, obligations have been imposed quite deliberately on both lift builders as well as component suppliers regarding the observance and increase of lift energy efficiency. This includes for example the EBPG (Energy-Run Product Act), which implements European Directive 2005/32/EC (Ecological Design Directive) in German law. It is to be expected that in future there will be implementation rules especially for lifts. (The VDI Directive 4707 likewise deals with the energy efficiency of lift systems, particularly with regard to new systems). 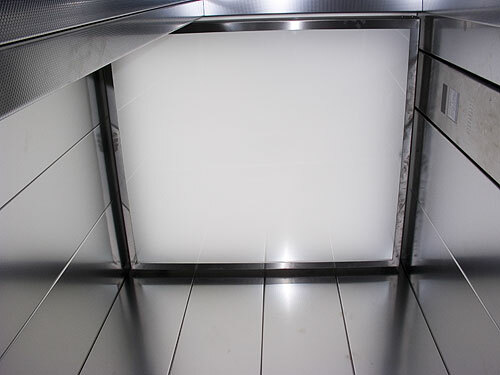 Cabin lighting definitely plays a great role in a lift‘s energy requirements. This is why the Düsseldorf company has also been working on lighting cabins with LED technology for about three years. The beginning was made with lighting in the product series CabinLED 3 and CabinLED 7. In the case of the 3-design the approach was modelled on the diameter and installation depth of the existing halogen lights. The procurement costs for these lights is admittedly low, but on the other hand they incur very high energy costs (in the case of poor efficiency) and have a short service life. 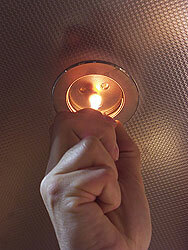 Compared to halogen lights, the use of W+W CabinLED produces an energy saving of about 85 percent. Thanks to new technology in the area of high performance LEDs, the performance of a CabinLED 3 (3W) corresponds to that of a 20 W halogen light. Given a cabin with 1 m2 floor space and an assumed electricity price of 0.20 euro/KWh, the saving within five years is 600 euros. According to the manufacturer, the service life of the high performance LEDs is five to seven years (if kept on 24 hours a day). 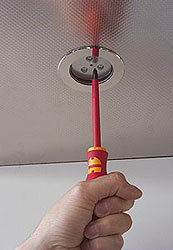 Expensive maintenance costs for the halogen light replacement in a four to six month rhythm are eliminated! 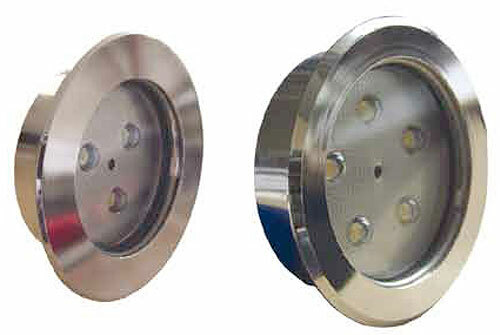 The CabinLED 7 cabin lighting has been developed for larger cabins or for cabins with existing cut-outs (d=70-74.5 mm). This light is also available in a vandal-proof design, according to EN81-71. After a year there was an increase in customer requests to provide CabinLED 3 lights with protective glass after all. The background to this was the use of the lights in public buildings or in low rent housing estates. A “vandal-proof” design may be overdone here, but the lights should be able to survive certain procedures (e.g. : to some degree scratch- and fire-proof ). The result of the development is the CabinLED 3 ESG (single pane security glass), a cheaper and smaller solution for lift cabins in the abovementioned environment. 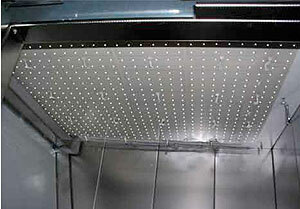 Cabin ceiling with "Homogeneous LED"
High performance LEDs are extremely sensitive to power surges and excess voltage. For reliable operation they require a precise working current, which is ensured by current regulators. To keep the design of the lights as small as possible and ensure the best possible heat dissipation to the current regulator ICs these were previously fitted in a separate housing. As a result of new technologies, the current regulator is integrated in the light housing in the new light CabinLED 5. This further reduces the already slight installation effort and cuts the power loss to the current regulator ICs to a minimum. Like the CabinLED 3 this light is also available with the ESG pane. Many cabin ceilings are equipped with homogeneous lighting. This is usually achieved with a laminated safety glass ceiling. 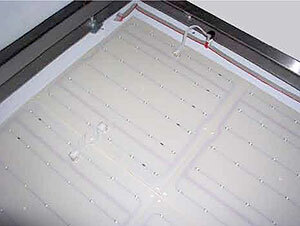 Here a series of fluorescent lights are arranged at a distance of about 15 to 20 cm behind the glass panel. The greater the distance, the more homogeneous the light appears. However, in the context of increasingly small shaft heads this distance cannot always be realised. Consequently, the LED panels mentioned provide a remedy. Three panel sizes are available: 24 x 24 cm (equipped with 36 LEDs; output 2.8W/panel); 24 x 12 cm (18 LEDs; 1.4W) and 12 x 12 cm (9 LEDs; 1W). The panels are bolted or glued next to each other like tiles to the cabin ceiling. They are connected to each other with small plug-in cables. A special Plexiglas panel is placed on the clear laminated safety glass in the suspended ceiling. An absolutely homogeneous light is created in combination with the LED panels. When fitted the LED panel and Plexiglas panel are about 6 cm apart. The energy saving with these LED panels is extremely great too. To light an area of 1 m² homogeneously all that is required is an output of about 50 W. The installation time is also reduced to a minimum thanks to the system‘s plug-in nature. In closing one can say that the LED technology will in future come to dominate in cabin lighting, as a result of the advantages mentioned, such as low energy consumption costs and reduced maintenance and installation costs. W+W Aufzugkomponenten will continue not just in this segment to make a contribution to such developments with new products and the latest technology. Technical report from Andreas Wallraff, for the first time published in the "Lift-Journal 6/2008"